Bush Warns Iran Of "Serious Consequences"
President George W. Bush Wednesday directed a stern warning toward Iran over an incident involving a threat by Iranian boats toward U.S. naval ships in the Persian Gulf. "All options are on the table to secure our assets" and there will be serious consequences if Iran provokes another confrontation with U.S. ships, Mr. Bush told reporters during a press conference with Israeli Prime Minister Ehud Olmert in Jerusalem. Mr. Bush said he and Olmert also discussed Iran's nuclear weapons ambitions along with Sunday's incident when Iranian boats harassed and provoked three American Navy ships in the strategic Strait of Hormuz. U.S. officials said Iran threatened to explode the vessels, but the incident ended peacefully. Mr. Bush, in Jerusalem as part of a week-long trip aimed at pushing the Israelis and Palestinians toward a peace agreement, said Iran continues to be a "threat to world peace." "It was a very dangerous gesture on their part," he said about the incident at sea. "They know our position and that is there will be serious consequences if they attack our ships - pure and simple. My advice to them is don't do it." Iran on Wednesday called the video and audio released by the Pentagon showing Iranian Revolutionary Guards boats confronting U.S. warships in the Strait of Hormuz "fabricated," an English-language state-run television station reported. Mr. Bush found himself challenged by his Israeli allies on a recent U.S. intelligence report saying Iran halted a nuclear weapons program in 2003. Tehran's nuclear ambitions are a chief fear in Israel, and the U.S. report led some in the region - both Israelis and Arab nations concerned about rising Iranian influence - to doubt the U.S. commitment to reining Tehran in. "The fact that they suspended the program was heartening," Mr. Bush said. "The fact that they had one was discouraging because they could restart it." Meanwhile, Olmert said Wednesday that "there will be no peace" unless attacks are halted from all parts of the Palestinian territories, including those not controlled by his negotiating partners in the Palestinian leadership. But he said that both sides "are very seriously trying to move forward" on a deal. "Israel does not tolerate and will not tolerate the continuation of these vicious attacks," Olmert said, after two and a half hours of talks with President Bush. "We will not hesitate to take all the necessary measures. There will be no peace unless terror is stopped. And terror will have to be stopped everywhere." On the first day of his eight-day Mideast trip aimed at pushing the Israelis and Palestinians toward an agreement, Mr. Bush declared there is a "historic moment, a historic opportunity." But he also said: "I'm under no illusions. This is going to be hard work." "America cannot dictate the terms of what a state will look like," he added. "We'll help." Mr. Bush's staff says the timing of the visit, his first ever to Israel during his presidency, shows his personal commitment to pushing the peace process forward, CBS News senior White House correspondent Bill Plante reports. Earlier Wednesday, an Israeli airstrike in northern Gaza killed two Palestinians and wounded four others, a move the Israeli army said was taken in response to Palestinian militants who had bombarded the rocket-scarred southern Israeli city of Sderot with rocket and mortar fire. Mr. Bush's arrival in Israel came amid ongoing land squabbles and fears of violence. There's been little headway since he hosted a splashy Mideast conference in November in Annapolis, which launched the first major peace talks in seven years. But Olmert, despite his tough words on terror attacks, spoke optimistically as well. "Your visit is timely and is very important to encourage the process that you and Secretary Rice helped start in Annapolis few weeks ago and that we, both sides I believe are very seriously trying to move forward with now in order to realize the vision of a two-state solution," the Israeli leader said. Mr. Bush said he believes both Olmert and Palestinian President Mahmoud Abbas" are determined to make the hard choices necessary." "Am I nudging them forward? Well, my trip was a pretty significant nudge because yesterday they had a meeting," he said. And he said he would step in when and if his involvement is needed. "You know me well enough to know I'll be more than willing to provide it," Mr. Bush said. Mr. Bush and his team stepped into a tricky issue - Palestinian anger about Israeli plans to build new housing in east Jerusalem and the West Bank. Those areas were captured by Israel in the 1967 Mideast war and are claimed by the Palestinians for their future state. Of Jewish settlements in the disputed areas, Mr. Bush said simply "They're illegal and they've got to go." Earlier, Secretary of State Condoleezza Rice also said that Israeli construction in Palestinian-claimed east Jerusalem constitutes settlement activity and is opposed by the U.S. Rice's comments, published in The Jerusalem Post daily, marked the U.S. administration's strongest criticism yet of Israeli policies in disputed east Jerusalem. The Palestinians are expected to put settlements at the top of their agenda when they meet Mr. Bush on Thursday. 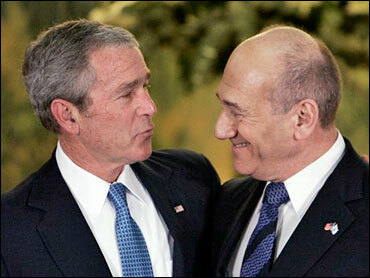 Said Olmert: "We must abide by our commitments and we shall do so." Mr. Bush also indicated a willingness to address Israel's concerns with the Palestinians. Israel has demanded that Palestinian forces do more to rein in militants in the West Bank. Since Olmert and Abbas last met, two Israelis were killed in the West Bank, and Israeli security forces say members of Abbas' Fatah movement were responsible. Mr. Bush said he would tell Abbas that his territory "cannot be a safe haven for terrorists."